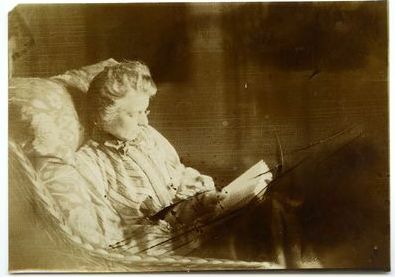 Beatrice Webb – co-founder of the London School of Economics – had a notoriously pragmatic approach to social affairs, coining the term ‘collective bargaining’ to describe the relationship between employers and employees negotiating working conditions. Cousin to social philanthropist Charles Booth, Webb immersed herself in aiding his research on Victorian urban slums and undertook several projects to further socialist and co-operative pursuits. Writing prolifically throughout her life, Webb published a plethora of pamphlets on those social movements closest to her heart, namely socialism and the concept of ‘Industrial Democracy’ (on which she produced a pamphlet in 1897). Webb also cultivated a salon-like company of social theorists such as economic historian Eileen Webb whom she termed in her diary a ‘cultivated, academic’ figure (28th June 1938) as they conversed upon social issues, sharing and critiquing each other’s political visions. Webb: reader, writer, social visionary. Living through the outbreak of both World Wars (dying aged 85 in 1943), Webb saw not only a wealth of social upheaval in Britain but also the reconfiguration of global politics at large as international relations were steadily becoming more globalised and the loss of the British Empire was a fast-approaching reality. 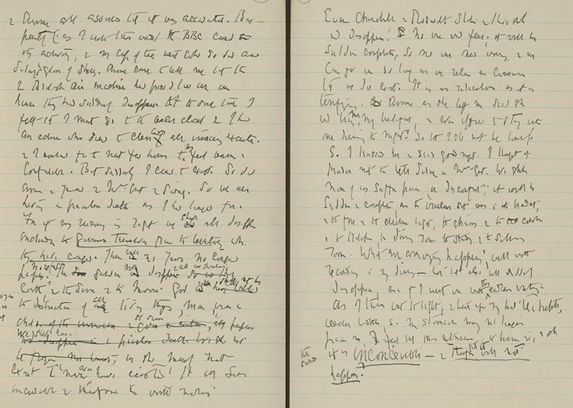 Webb’s personal diaries provide an intimate insight into her view of the Second World War and the dynamics of economic and political relations during the early- to mid-twentieth century. Despite her rather questionable support of the Soviet economic arrangement (perhaps deriving from an ignorance of Stalin’s true political system and reign of terror), Webb nevertheless maintained an admirable support of progressive politics and an aversion to exploitative bourgeois commercial systems as she championed the moral and economic rectitude of federal co-operatives. With the LSE her self-termed ‘symbolic child’, Webb’s support of educational institutions suggests that she was open to a continually forward-looking reassessment and evaluation of social theories such as her own, always eager to develop resolutions to the ever-evolving demands of the global economic system. 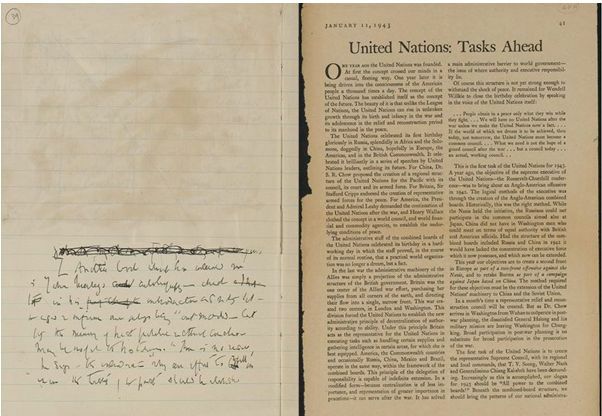 One particular entry from her diary demonstrates her interest in the formalised inter-dependent system of global relations marked by the founding of the United Nations commenced with the January 1942 Declaration. Keen to discuss political and economic issues in a public, transparent domain, Webb writes in March 1941: ‘Arnold [Freeman] here for tea and talk. Discreet and reserved about his outlook on the war; he lets it be assumed, that today, he supports it as inevitable’. Whether or not this were the case, Webb was determined to analyse the specific circumstances that brought about such a cataclysmic event and, more crucially, the correct means by which social relations should be settled. Proceeding in the same entry to state ‘[h]ow much easier it is today to agree on what you oppose and denigrate than to agree on what you desire or approve of, in home and foreign affairs’, Webb never shied away from facing social issues forthrightly as she sought to compensate for the lack of any ‘common living creed in Great Britain today’. Although not officially affiliated with the UN, Webb’s endorsement of the organization from its founding days exemplifies her wider belief in open dialogue, constructive resolution-building and a relative degree of political equality. Although primarily remembered for her work in the economic field, her developments here were inextricably related to a larger social vision that supported collaboration, reformation and innovation. The Commission on the Status of Women was founded in February 1947 with a band of 15 female government representatives. The CSW was supported by what later became the Division for the Advancement of Women in the UN Secretariat, also working closely with NGOs and members of the UN Economic and Social Council. Concerned with establishing standards to mitigate sexual discrimination, the Commission fought against the use of ‘men’ as a generalised term for ‘humanity’. In this way, they sought to alter the UN’s language as an initial means of altering an institutionalised world view that women were inherently of a lower status. In addition to this subtle re-codification of the traditional attitude towards women, the Commission also enacted practical measures to champion women’s rights such as the 1953 Convention on the Political Rights of Women that stood as the first international recognition of women’s marital rights. The Commission also sought to establish an autonomous identity for women without marriage; working with the ILO during the 1950s, the CSW facilitated the fruition of the Convention concerning Equal Remuneration for Men and Women Workers for Work of Equal Value to support equal pay between the sexes. Today the Commission exists as UN Women – an amalgamation of four bodies previously functioning independently within the UN. Multiple conferences dedicated to the issue of women have been held over the course of the UN’s existence and their work spans all fields from, inter alia, economic empowerment to health and security.